Yuki Ninagawa made her debut as an actress in 1978 as she was chosen out of 3000 candidates to play the heroine in Kohei Tsuka’s Rock Opera “Salome”. She received The Best New Actress Award in 1981 for her performance in “Kurutta Kajitsu”. She established her screen actress career by playing leading roles in many movies. Ninagawa challenged theatre works, such as “Kanadehon Chushingura”, “Nigori -E” etc. and her steady performance was highly acclaimed by many theatre critics. In 2004, she wrote, directed and played her first film “BARAMERABA”, based on a short story by Seijun Suzuki. In 2008 her graphic art exhibition titled “BARAMEKUTOKI” was held at Tokyu Bunkamura Gallery, which brought her Art of The Year Award from JICS (Japan Information-Culturology Society). 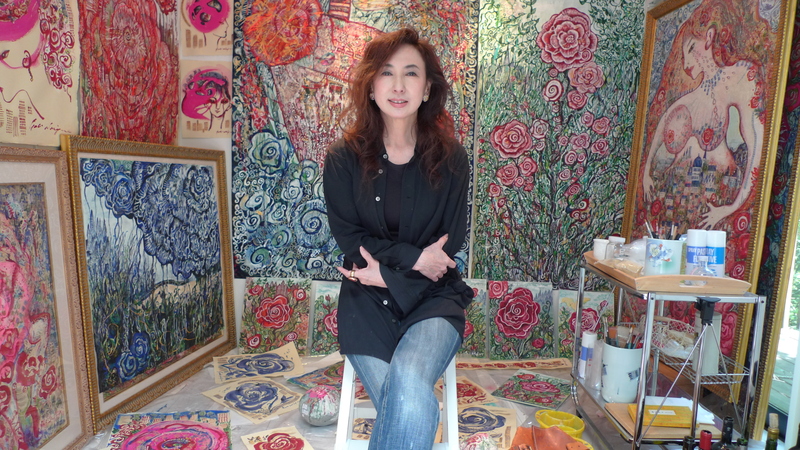 After that, held numbers of large private exhibitions under the theme of rose such as “Yuki Ninagawa Painting Exhibition: BARAMANDARA” (2010), “BARATOSHI” (2012), “BARAMEIKYU” (2013), and more. Her attractive paintings, using natural mineral pigments “IWA ENOGU” have attracted many people. Ninagawa has contributed to many art activities of this country, such as a board member of Special Award selection committee at Innovative Technologies, and an advisor at Aomori Museum of Art. etc.. In 2016, became a guest professor at Taisho University.